Here is the latest on the draft. I’ll leave here about 3:00 p.m. on Fri. as we did the last time and I suppose we will get in to Chicago or rather Great Lakes at about the same time. They have made or at least we think they have made reservations for me to come back on Thurs. the 11th so that will give me a little more time than I had before. Maybe that will help you to formulate your plans. I’ll probably send you a wire from some place along the line and I won’t write to you again tomorrow. [page 2] we can work this rather often. In other words – why don’t we do this more often? There are a number of things that have to be done around here getting all the gear, etc., together so I’ll be rather busy besides Jack Howell and Stanich want to have dinner out this eve but I’ll tell them we have to get home early. Well, give the word to the O.D. at the Lakes and I’ll be seeing you. 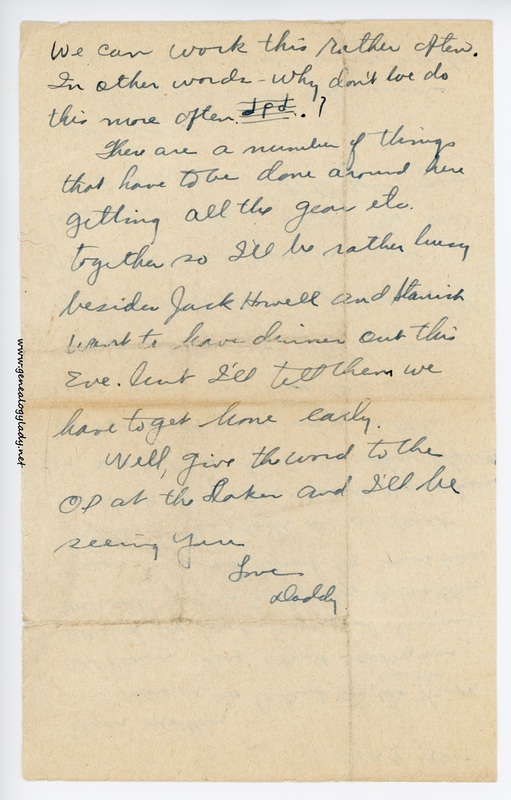 This entry was posted in Foster, Genealogy, World War II, World War II Letters, Yegerlehner and tagged California, genealogy, Gladys R. (Foster) Yegerlehner, Lt. 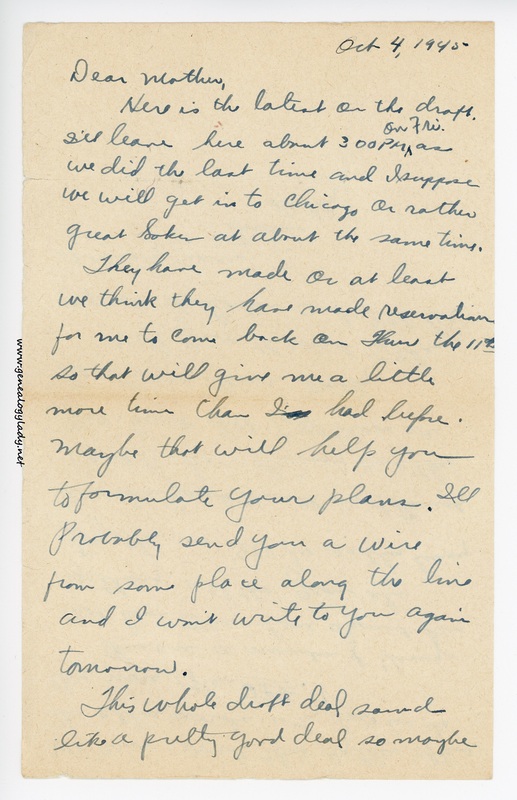 Commander Jack M. Howell, Navy Receiving Hospital, Roscoe S. Yegerlehner, San Francisco, Vincent M. Stanich, World War II, World War II letters on June 27, 2016 by Deborah Sweeney. I can only imagine the excitement of going home!!.. These letters have sure given me the realization of how hard life was for Wives and kids left at home! I never realized or thought about rations, coal delivery and the manual labor it took to get it where it needed to be! I have been spreading the word to friends and family that they need to read all of this!! Thank you for sharing!! Thank you Janet! I appreciate all the publicity I can get. On a side note, I believe there have been couple letters recently that have mentioned your father’s first wife.